The residents of Stanitsa Luganskaya live in hope of liberation from military occupation by the Kiev forces—marauders who are engaged in widespread robberies and the looting of the civilian population. But this is not even the worst example of lawlessness perpetuated by the Ukrainian punitive forces: on the slightest suspicion of collaboration with the Lugansk People’s Republic (LPR), individuals are subjected to extrajudicial detention, inevitably leading to outright disappearance. Virtually all the residents of Stanitsa Luganskaya express unmitigated disgust towards the occupiers. Many of them plead with the LPR for help in liberating them from this yoke. “For any attempts to communicate with the LPR authorities or transmission of information about the true state of affairs in the settlement, the Ukrainian Nazis threaten people with criminal prosecution and even death. Moreover, there are numerous accounts of locals simply disappearing without a trace. But residents of Stanitsa Luganskaya continue to write to us, begging for help, because they have no one else to turn to,” said the LPR serviceman, as quoted by the LIC (Lugansk Information Center). “Everyone is waiting for the day [when you finally liberate us]. After all, what hope is there that [the Ukrainian forces] will simply pick up and leave on their own? Nor are we going to abandon our homes: we will stand our ground, we will outlast them, and we will wait for you,” reads a note given to the LPR soldier by a woman, a resident of Stanitsa. According to the author of the letter, the Ukrainian fighters ransack the homes of local residents, taking anything they like, without remorse or shame, and openly send the cargo back home. “And, meanwhile, we have no idea how to survive the winter, what to heat our homes with—you probably know that the tariffs for central heating that we have here now are ‘European’,” reads the woman’s note. “So, our dears, we wait for you—do not leave us. When they start shooting at night, the first thought is that maybe our people will finally come, that our suffering will be over at last, and that we will start putting things in order, working again and rebuilding in peace,” the author’s fledgling hope continues to break through in her letter. It bears mentioning that the residents of Stanitsa Luganskaya, a settlement located on the line of separation between the LPR and Ukraine, in the territory controlled by the Kiev forces, constantly pass notes and letters to the servicemen of the LPR People’s Militia posted at the bridge between the two banks of the Seversky Donets river. In one of the letters, the residents of Stanitsa Luganskaya call this bridge—a transportation hub blown up by the Kiev forces—“the road of life,” an artery through which the long-awaited peace will finally flow to their homes. 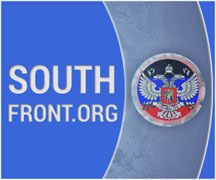 At this time, the LPR maintains only one official checkpoint on the line of contact with the Ukrainian side in the vicinity of Stanitsa Luganskaya. However, due to intentional destruction of the bridge by the Ukrainian forces during their retreat in 2014, no transportation traffic is possible along this route (which remains the only access point to the opposite bank of Seversky Donets). The LPR has offered to restore it. “Dear boys, sons, warriors under the banner of St. George, I tried starting this letter several times, but tears—tears of pain and terror—made it impossible for me to write. I live in Stanitsa Luganskaya. I have lived here my whole life. It has never been this hard. How can I explain what it is like for us to live here now? Are there words that could help you feel the desperation with which we wait for you? How tired we are of waiting and of being afraid, and how scared we are to live with these people? They are thugs, bandits; they torment and persecute us, coming here for entertainment, as if they were on vacation; they drink themselves senseless, carousing and plundering. But the worst are those who believe that they are defending us from you, from Lugansk, even from Russia —those are the real monsters. They are alien here, and we are alien to them. They come, and the first things they do is look for places they can plunder to add to their purse—whatever they think they can use, they take and send home. These are the lower ranks, of course. I dare not imagine what the higher ranks do… It is a good thing we are small fry to them—they make their money from war. And, meanwhile, we have no idea how to survive the winter which is coming. What will we heat our homes with when the freezing temperatures come? You probably know that the tariffs for central heating that we have here now are on the “European” scale. It is tough to live in “independent” and “liberated” Ukraine. I have no idea how to survive this winter. People say that these fascists will leave us eventually. Everyone waits for this. But I have no such hope. Why would they ever leave on their own? Way back, the fascists did not leave voluntarily, and they will not do so now. Nor are we going to abandon our homes: we will stand our ground, we will outlast them, and we will wait for you. When they start shooting at night, it is hard to tell anymore whether I am afraid or not. Thoughts come to mind that maybe it is a good thing, that maybe it is our side, that our people have finally come and that our suffering will be over at last. That no one will march us into Europe like slaves. That we will start putting things here in order, working and rebuilding in peace. If you only knew how many houses these devils have burned down and demolished! How many lives they have wrecked.